So Marvel announced their first look at "Daredevil," the new television series that will be made available on the Netflix platform this April. Not only will it be the first attempt to bring the character to life onscreen since Ben Affleck's try back in 2003, it will be the springboard for a brand new major story-arc for the Marvel Cinematic Universe. Yep, that is correct. Not only has the MCU ventured into television with "Agents of S.H.I.E.L.D." and "Agent Carter" on ABC, but they made a big deal with Netflix and now the streaming company will create four new television serials which take place in the same continuity with the MCU's movies and shows, and each of these new serials will build towards a mini-series. Essentially Marvel is making a mini-Avengers on Netflix, and "Daredevil" will be kicking things off this spring. While I was reading online today, I have already seen people frantic about how these new Netflix shows will tie into the rest of the continuity Marvel has created already. Some people are already theorizing that characters from the shows and minor characters from the movies are seriously going to end up in this thing, just so people feel better about these shows being connected to the big picture. Personally, I don't care how they connect these shows to rest of their continuity, and I don't think I care if they drop hints or Easter Eggs or anything like that. Daredevil is a much different character compared to say, Iron Man or Captain America, and Marvel has an opportunity to expand their universe a little bit. Daredevil and the other three characters Netflix is developing shows for (named Luke Cage, Jessica Jones and Iron Fist, respectively) are street-level heroes. They are not going around the world fighting terrorist organizations, or Asgardians or aliens. Their goal is to keep the streets of New York City clean. They are safeguarding the streets while the heavy hitters take out the bigger fish. I am not saying that Daredevil and these other characters are never involved in any major Marvel story-arcs, but their adventures are, as a whole, localized. Marvel is going to need to be very careful about how and when they drop connections to the rest of their franchise. If they force a character into one of their episodes just so they can say "IT'S ALL CONNECTED" it is going to feel wrong. I mean, if there is one major gripe I have with "Guardians of the Galaxy," its that the movie goes WAY out of its way to connect itself to the rest of the MCU, and that it a little odd. They really don't need to give the audience their little wink-wink with every property. Anyway, back to the show. I think the trailer looks great, and I am excited and curious to see how they explore the character. The biggest problem with the Ben Affleck movie is that it tried to be a family-friendly superhero movie while also trying to explore some gritty and dark storylines, and it just didn't work as film. Judging by the trailer for the Netflix show, it seems the show will commit much more to the seriousness of the character and that's cool. Daredevil has several similarities to Batman over at DC, but he's a very different character at the same time. If Marvel can explore that well, then this first show is going to be a hit. I mean, looking at the people involved, there is no reason this show shouldn't be hit. 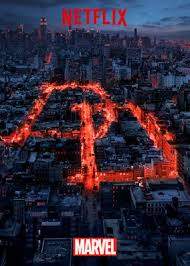 I have loved the work of Charlie Cox since I saw him on HBO's "Boardwalk Empire" and I am telling you right now, the character of Daredevil is in excellent hands. As far as The Kingpin is concerned, you just can't get better than Vincent D'Onofrio for the character and just looking at his appearance and how well he's nailed it, I am instantly eager to see him throw down. We also have Elden Henson from The Mighty Ducks and Rosario Dawson in the cast too. The show itself is being run by Steven S. DeKnight, who created and wrote "Spartacus," one of the best television shows of the last five years. So yeah, I am incredibly excited to begin binge watching this series. I am dying to see how this new angel of storytelling plays out for Marvel and I can't wait to see how this all ties into the bigger picture. The trailer has sold me and I bet it will for you too.